For when space is at a premium. Space can be difficult to find. A challenge for people everywhere — whether you’re living in a crowded city or going to a school with a lockdown on field space timeshare — finding room to throw and work out for ultimate can at times be tricky. Not all of us get indoor turf practice facilities or tracks, or even a chance to share a gym or basketball court; in fact, most of us don’t, but that shouldn’t stop your training and throwing. Even a small amount of space, if used properly, can be a great opportunity to do some solo or paired prep for your season. Especially tough for those of us who live in cold, snowy, or icy climates, working out in the off-season (arguably the most important time for individual improvement) can be so difficult that sometimes we have to resort to training in our living rooms. However, even living rooms have limitations. You can’t throw or cut or sprint inside your place, so sometimes you have to venture outside into whatever space you can find. Here are three workouts that you can do in a limited amount of space, with almost no equipment, that can help you improve your footwork, agility, muscle strength, and cardio-vascular abilities. You’ll need a spot about 20-25 yards long and 10-15 yards wide. This could be a small section of your local park, a spot off to the side of a field, your backyard, or even some public grass beside a library or school. It is highly recommended you find some grass or turf, which is not only better for real simulated footwork, but also a softer surface for your joints. Check non-peak times (and sometimes brave the cold or rough weather) to find some space for yourself. If you’re in a really crowded place (or there is snow on the ground), a driveway, alley, or section of gym or basketball court will do in a pinch. Before your workout, walk the area to look out for holes, cracks, or debris that might cause you injury. Be sure to do your full, normal ultimate warmup to avoid straining a muscle. If you can find a partner, add throwing before and after each workout to maximize your abilities. If you can’t find a partner, set up a stationary target and do your best to hit it consistently with a set of discs, adding in fakes, pivots, and different throws. Cone set up for serpentine agility drills. This workout is designed to increase your quickness, improve your footwork, and generally make you more explosive and agile. After your warmup, set up your cones to make use of the full space available to you by dropping the first at one end of your available space and another about 20 yards away. Then, fill in the space between with your remaining cones in a serpentine pattern, walking each cone about five yards away in a diagonal opposite direction from the last one. As easy as that, you have created a small agility course. 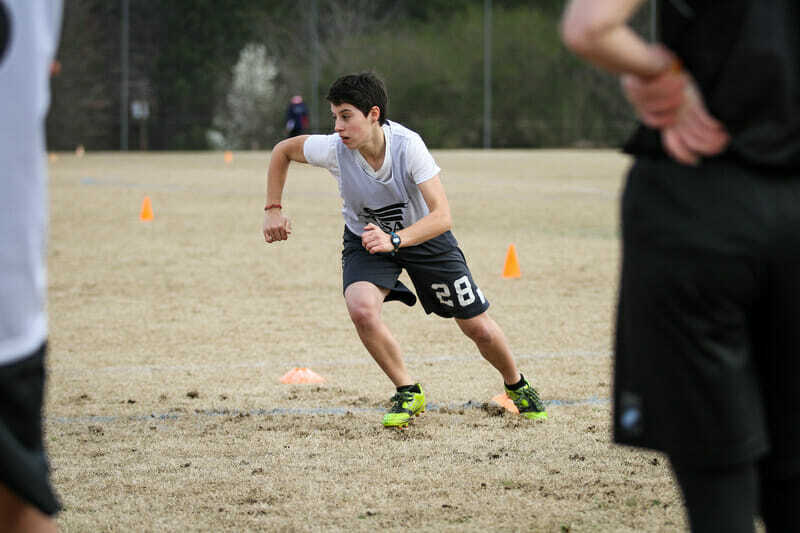 Running the course (ideally with cleats on grass or turf) can work on a variety of things such as planting and changing direction, exploding out of a jab step, keeping your feet and hips under you, and can improve your quickness and fitness. Try to do each agility drill twice, working on alternating directions and your lead foot. Be sure to work on going to and around each cone, but also work on keeping sharp angled cuts (think 45 degree angles or less). The tighter you are able to slice around your cones, the easier you’ll be able to cut under, past, or with an opposing ultimate player. You can add a good cardio element to this workout by doing Tim Morrill’s “Goose Cones.” Space five cones out in a straight line at five yard intervals. Starting at the middle cone, cut hard to the first cone in one direction. Plant, change direction, and sprint past your middle cone to the next “short cone.” Plant direction again and go to the very end of the line. Again plant and go the full twenty yards to the opposite end of the line. Then plant, change direction, and touch the middle. If you can handle it, once you’re back to the middle, repeat the entire drill a second time in a single rep, but starting in the opposite direction. It will only last about 30 seconds but it can be tough. Completing six or eight Goose Cones reps will last about 15 minutes and give you a really good conditioning workout, while also helping your body change direction quickly. An extra enhancement is to purchase an agility ladder, the ultimate tool for working on footwork in limited space. Set your ladder up and really work on footwork, quickness, and your jab step through a variety of agility ladder drills for another 15 minutes. One of the best things about this workout is that weekly practice can produce noticeable gains in a critical area that is too frequently overlooked by ultimate players. This circuit workout is designed to increase your body muscle strength with an added cardio component by targeting exercises for four major muscle groups: core, upper body, lower leg, upper leg. Run each station for one minute before moving to the next station, completing four full cycles for a total of 16 minutes. You can choose a single exercise to do at each station each time, or you can mix it up. This High Intensity Interval Training (HIIT) workout should be pushed to the max in each exercise and then ideally you should sprint between each station, even if it is only five yards apart. It’ll be tough to grit out each minute on these circuits with high intensity, but you’ll alternate muscle groups which will help. It’ll be a tiring, but great workout if you can push it. Add a nice wrinkle by carrying a disc with you to each station, picking it up and tossing it to the next station at the end of each rep (or throwing to a partner before sprinting to the next station). Want even more cardio? Add some shuttle runs at the end. Set a cone at each end of your space (ideally 25 yards) and then run back and forth between the line three times (150 yard totals) for great burst conditioning, or six times (300 yard totals) for good endurance conditioning. Again, six to eight shuttle runs will really push your cardio vascular abilities. The SNERTZ ultimate workout is a classic and grueling session, one of the earliest workouts designed specifically for ultimate. If you’re on the younger side and haven’t ever heard of it, or if you just need a refresher, take a look and maybe try the full thing. Anyone who has accomplished this beast of a trial will be able to share just how fully it can wreck (in a good way) a body. However, there are some downsides to the full SNERTZ; all the pounding and jumping can be pretty rough on the joints and can lead to injury if done incorrectly or too much, plus the full workout takes a fair amount of time and lot of space. Here’s a modified version that be just as effective, but a bit more streamlined. These exercises, when done right, will really push your heart, lungs, and lower legs to exhaustion. However, as mentioned before, be aware of the surface you are doing this on. Pavement or even gym floors will do a number on your knees, even if you’re able to control your landings effectively. Picking the ‘Ground jumps’ and ‘Jump trucks’ as a priority is the best option, and if you’re gonna skip on something, take out the frog jumps. Lunges can be taken slowly and purposefully, if you’re legs are up to it. The pushups and sit-ups are a good “break,” during which you’ll test your body. Adding either Goose Cones or 150-yard shuttles for the second half of the workout will continue the cardio, force you to run, and (more importantly) provide practice planting and turning through cuts when tired. If you’re able to run these well, they’ll be far more effective than the 5-10-5 shuttles and 40-yard explosions the original SNERTZ workout prescribes. With minimal space and some dedication and effort, these three workouts will mold your body in a variety of ways. Alternating between them once a week, especially during an off-season, can keep you sharp and ready for live ultimate. Alex "UBER" Rummelhart is an Ultiworld reporter. He majored in English at the University of Iowa, where he played and captained IHUC. He lives and teaches in Chicago, Illinois, and has played for Haymaker, Chicago Club, and Machine. He currently plays for Chicago Wildfire. Alex loves writing of all types, especially telling interesting and engaging stories. He is the author of the novel The Ultimate Outsider, one of the first fictional works ever written about ultimate. Comments on "Tuesday Tips: 3 Awesome Ultimate Workouts You Can Do In Your Backyard, Presented By Spin Ultimate"